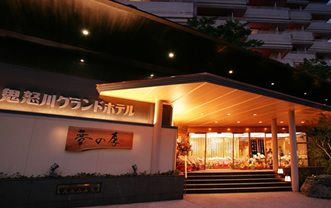 The hotel offers variety of rooms with respective characteristics, such as rooms where Japanese and Western styles are combined or those where the guests can enjoy the scenery of the Japanese garden. The guests can choose their favorite rooms depending on the number of staying guests and/or purpose of the visit. Diners and breakfasts are served at the dining hall. In addition, the guests can use the grand baths and open-air baths anytime without any limitation during the operating hours, as well as the charged spa facilities and the chartered open-air baths. In the night time, our bar lounge offers elegant time with music and drinks. Whether it is one-night stay or long-term stay, you can spend your time in the style you chose at KINUGAWA GRAND HOTEL YUME no TOKI.